A cloud-seeding generator dispenses silver iodide into the atmosphere to coax more snow to fall. 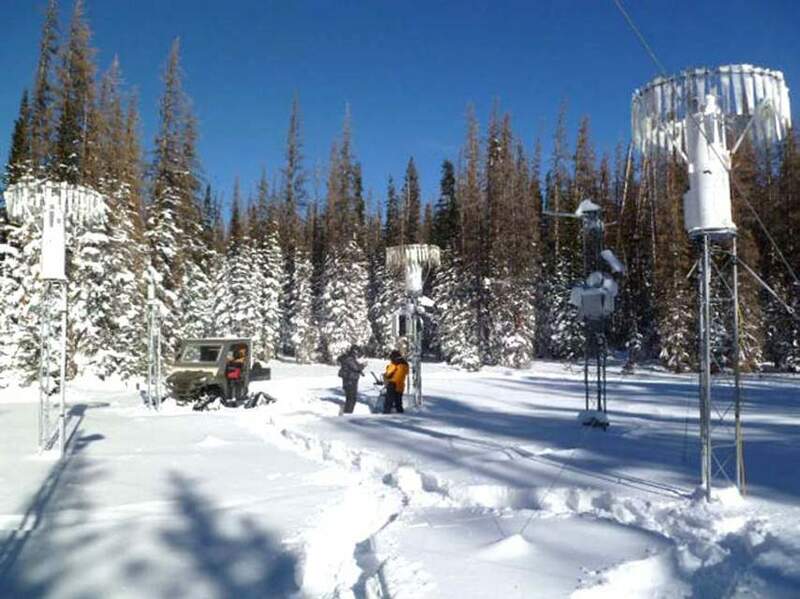 A $15 million cloud-seeding study in the mountains of Wyoming recently showed good results. The 10-year experiment was reviewed by the National Center for Atmospheric Research, which concluded that cloud-seeding produced between 5 and 15 percent additional precipitation. Amid a 15-year drought, regional ski areas and water districts are continuing to invest in cloud-seeding to augment snowpack. 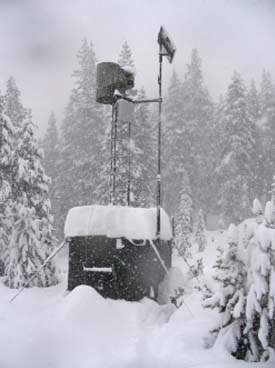 The weather-modification technology attempts to coax more snowfall from winter storms by injecting silver iodide into the cloud from ground-based generators. Telluride and Purgatory ski areas contribute funds for regional cloud-seeding programs, and so do the Dolores Water Conservation District, Animas-La Plata and Southwestern Water Conservancy districts. During a meeting Wednesday at the DWCD office in Cortez, an update was given on the regional cloud-seeding program and ground-breaking research recently completed on the technology in Wyoming. “Interest in cloud seeding has grown, and funding has grown,” said Bruce Whitehead, executive director for SWCD. Western Weather Consultants provides cloud-seeding services for three programs in the San Juan Mountains including over the Upper Dolores, La Plata, and Animas River basins. From November 2014 to April 2015, 25 cloud-ice nuclei generators dispersed silver iodide into storm clouds for a total of 875 hours, at a cost of $105,678. The units are in the vicinity of Cortez, Dolores, Mancos, Mesa Verde, La Plata Mountains, Stoner, West Fork, Groundhog, House Creek, Placerville, Cahone, Lone Cone, Disappointment, Hesperus, Electra Lake, Bayfield, near Purgatory, on the Florida River and elsewhere. When dispersed in optimum storm conditions, the silver iodide enhances the formation of ice crystals in clouds, forcing more snowfall, said Mike Hjermstad, a technician with Western Weather Consultants, based in Durango. “The generators are turned on manually, and when the conditions are right, it can increase snow accumulation from a storm by a half inch,” he said. His company is experimenting with generators that could be turned on and off remotely from a computer. The manual units currently require a nearby resident to turn them on and off when directed. Automated units would allow them to be placed at higher elevations, nearer to the clouds where they are more effective. “Remote control would allow us to turn them off during lulls in the storm,” Hjermstad said, and higher placement reduces inversion impacts. Installing a radiometer weather station is also an effective tool for cloud seeding, he said, but they are expensive and not used locally. The stations accurately detect moisture levels in a storm, allowing operators to better decide when to best release the silver iodide. Generators that disperse propane are also used in cloud seeding, and work better at higher temperatures, ideal for local ski areas looking to boost snow in November. Cloud-seeding skeptics question whether the procedure actually works because it’s difficult to verify increased snowfall from cloud seeding versus what would fall naturally. Proponents point to experiments that show areas with cloud seeding had more precipitation compared with control areas that did not get the treatment. “Detection of very minute levels of silver iodide in the snowpack is also a proof,” Hjermstad said. Rising costs of new technology such as radiometers, automation, and more snotels is a concern, said Ken Curtis, an engineer for DWCD. “The funders need to have consensus on where the program is going, if it will be enhanced or stay static,” he said. Barry Lawrence, of the Wyoming Water Development Office, gave a presentation on a recent groundbreaking cloud-seeding study that showed good results. The 10-year study cost $15 million and was funded by the Wyoming Legislature. The elaborate experiment positioned remote-control seeding stations in the Wind River Range and in the Medicine Bow Range. When winter storm conditions were ideal for seeding in both ranges, only the stations in one range were triggered on. The range without cloud seeding was the control, and then snowpack from both ranges was compared for that storm. Control ranges were alternated throughout the experiment. Despite some cross contamination in the controls, additional modeling and statistical analyses showed cloud-seeded ranges overall benefited from additional snowfall, Lawrence said. “Our independent evaluator, the National Center for Atmospheric Science in Boulder, concluded cloud seeding from the experiment resulted in 5 to 15 percent in additional precipitation,” he said. Encouraged by the results, the Wyoming Legislature recently approved $1.5 million to install operational cloud-seeding stations in the Medicine Bow Mountains and other ranges.